According to The New York Times, “some economists say” oil companies aren’t taxed highly enough, despite being subject to the highest effective tax rates among all industry categories. “Some (economists/scientists/experts) say” is one of the oldest tricks in the Old Grey Lady’s handbag. With precisely the same amount of research and data collection that went into the Times’ assertion, I can say without fear of contradiction that “some economists” are idiots. Journalists too. 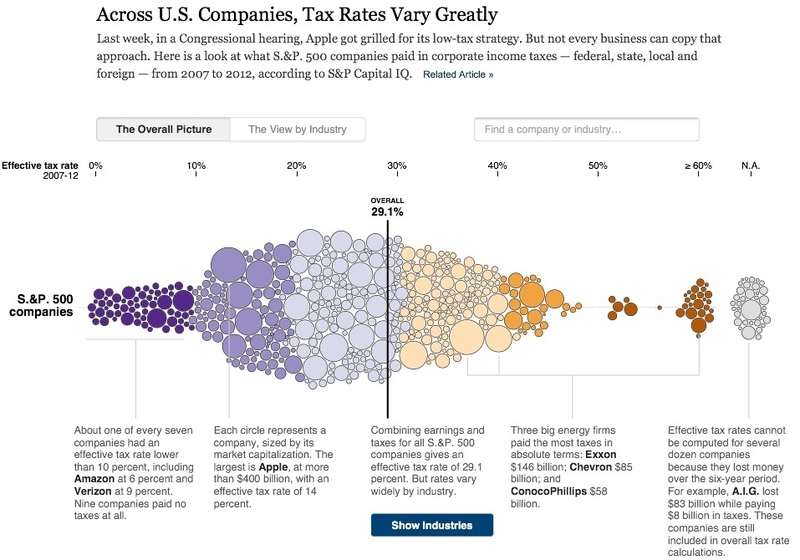 The “some economists” comment was gratuitously tacked onto an otherwise interesting graphic study (reproduced in part below) on the effective income tax rates paid by American corporations, reported by company size and by industry. Link to original NYT graphic. Note that the three largest oil and gas companies paid $289 billion in income tax from 2007-2012. That’s separate from any royalties, lease bonuses or other fees paid, and separate from income taxes paid by employees, royalty owners, etc. The amount they paid means the oil industry took Win, Place & Show in the taxpaying horserace among all U.S. firms. Large oil companies typically pay high rates, but some economists say that the high rates do not cover the pollution costs imposed on society. Really? Tax rates 50+% higher than, say, Industrials don’t cover “pollution costs”, whatever those are? Severance taxes are payable on production under state jurisdiction. Native American tribes can also levy a severance tax in addition to state taxes for production on tribal lands. The average rate is probably 7% of gross revenue (not profit), and is a category of tax that is not considered in the Times’ analysis of income taxes. In the larger oil and gas producing states, severance taxes are an important component of state revenue. Regardless of what “some economists say”, oil and gas carries an enormous tax burden already. I wonder who “some economists” think would absorb any additional taxes? And at what point would a punitive tax structure chase these companies away? The Times, bless their hearts, had to say something. The whole study flies in the face of conventional (Times) wisdom and the “progressive” canard that the oil companies are huge beneficiaries of Washington’s largesse in the form of tax credits and subsidies. After all, it must be true because “some economists” say so.